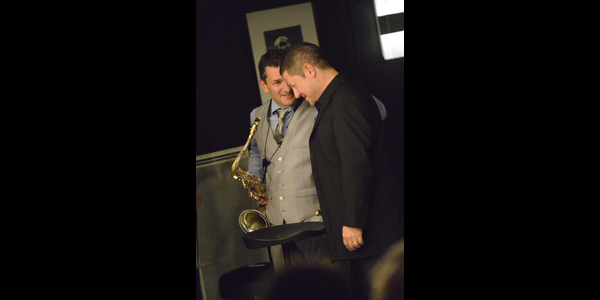 We Five featuring Jim Rotondi - Michael CHERET "Official WebSite"
Jim Rotondi, international trumpet jazz player, is on the jazz scene from more than 20 years, as a leader and as sideman of the greatest such as Ray Charles. His personal playing, powerfull and full of swing reminds the great Freddie Hubbard and all the jazz legends. He’s definitely part of the great jazz players. Graduated of North Texas university, he win in 1984 International Trumpet Guild’s Jazz Trumpet Competition. Then he moves to New York and paly and record with great jazz players– Ray Charles big band, Lionel Hampton, Toshiko Akiyoshi, Bob Mintzer, and smaller combos such as Charles Earland, Lou Donaldson, Curtis Fuller et Joe Chambers. Jim actually leads two groups : a quintet with Joe Locke, and more electric Full House, with pianist David Hazeltine. He is a main member of the sextet One For All with Eric Alexander (saxophone), Steve Davis (trombone). We Five is a quintet around Jim and his hard-bop modern music. The group has this typical New-york energy and the Blue note spirit. With André Michelutti, italian drummer we can also hear by side of the great Jerry Bergonzi, Olivier Truchot, pianist virtusoso, Brice Berrerd, powerfull and surprising bassist , and Michael Cheret, tenor sax in between tradition et modernity, with an intense sound, typical of the great tenors who he learned with.